Last weekend CRSSD Fest administered a potent dose of dance music to a loyal house & techno crowd at Waterfront Park along the San Diego bay. This marks the 8th installment of the biannual festival which has practically become the pre and post party of summer for the local dance community. FNGRS CRSSD, the parent company of CRSSD, has been an essential driver in the development of a thriving house scene and maturing tastes here over the years, and proved once again with this weekend, they’re a force to be reckoned with on an international scale of event production. We welcomed some of the most in-demand talent on the electronic circuit, reconvened with our dance fam, and collectively basked in beats with new friends on the dance floor. Aside from a spectacular natural backdrop of the bay views, sunsets that awed the audience, and planes touching down at the nearby airport, the festival also offered a craft selection of beer and whiskey, as well as a diverse food selection ranging from sushi, lobster rolls, Korean BBQ and of course, pizza. From a logistics standpoint: security, line wait time, bathrooms were all on point, however running out of the water at refill stations was a miscalculation that took us by surprise. True to CRSSD Fest form, photo op backdrops included neon signs with phrases like “Music Sounds Better With You”, a nod to Stardust’s French House classic, revived by Daft Punk. A sound bite from this song would appear throughout the weekend, sewn into many of the artists sets. Other ‘easter eggs’ included DJ’s shouting out other acts on the bill, such as Flight Facilities playing Dusky’s heater, “Careless”. 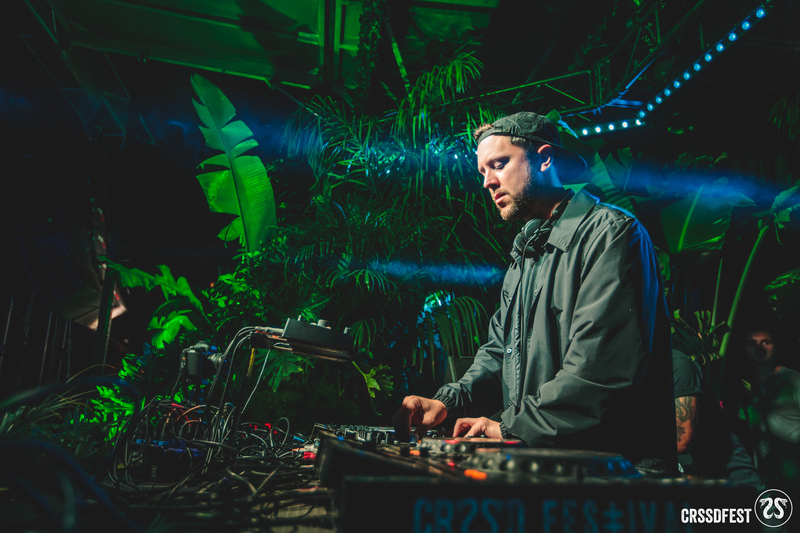 The first and most ornate stage upon entering the festival, The Palms Stage, hosted the likes of Darius, Thomas Jack, Will Clarke, Oliver, Claptone and Dusky with DJ booths immersed in quite literally a jungle of foliage and palms. This dancefloor held the most immersive environment of them all, with a canopy lined with hanging paper parasols, festival goers splash dancing in the fountains to the left and the Star of India ship on the right. With compelling mix of house, progressive, hints of tribal and even nu-disco – it offered all shades of genres and was a staple of the event. Techno devotés found their home at the City Steps Stage, in the middle of the venue aptly named from it’s location in front of the County Administration building. It curated techno’s kings and queens: Nina Kraviz, Mind Against, Matador, Pig&Dan, and Helena Hauff. Not to mention a touch more melodic techno features such as John Digweed, Yotto and a B2B set with Guy J and Jeremy Olander. FNGRS CRSSD didn’t stop there though, the weekend’s entertainment continued at satellite partner locations around the city at venues including Kettner Exchange, Vin De Syrah, Bang Bang, and recent addition, Rich’s Nightclub! All in all, CRSSD Fest continues to provide San Diego with a world-class House & Techno event. The variety of music styles, environment and community of music lovers, measured up to the gold standard that we’ve come to expect from the event, and hope to see for years to come.